The Yule goat, erected each year before Christmas in front of the furniture giant IKEA in Reykjavik is back up again for the seventh year in a row. Almost every time, the goat has somehow either been set on fire by arsonists or destroyed by wind. Those not familiar with Scandinavian Christmas traditions may find themselves a little confused in Iceland today as they overhear conversations about the arrival of the ‘Christmas goat’. The ‘Christmas goat’ or ‘Yule goat’ is a Scandinavian and Northern European Christmas symbol and tradition, probably dating back to pagan days, and is nowadays a particularly popular tradition in Sweden. 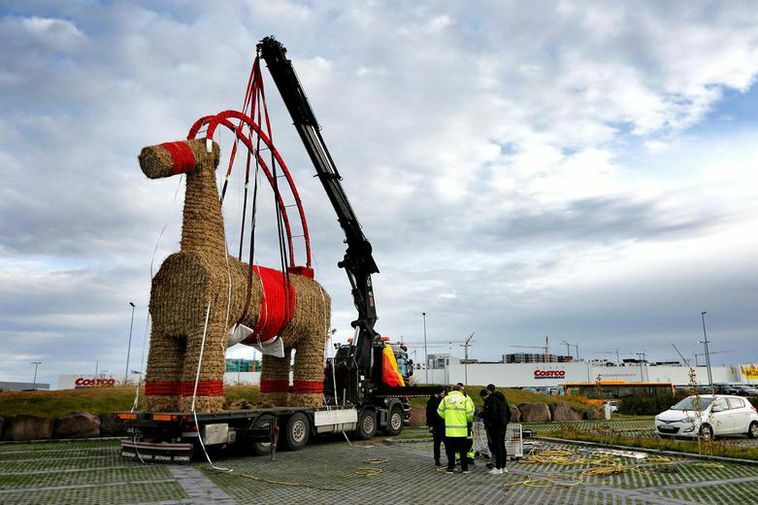 It manifestation is Iceland is the large straw Christmas goat installed each year by Swedish furniture giant IKEA outside its store in the Greater Reykjavik town of Garðabær. Covered in thousands of lights, the six-metre-tall structure towers overs the surrounding landscape, bringing light and Christmas cheer as the winter nights draw in. The goat was set on fire twice and twice it was blown away in a storm. Last year it self-combusted due to faulty Christmas lights. This year, there is a new lighting system and an electric fence to keep away arsonists. Security camera have also been placed all around it.